The Hopi are an ancient culture. Their language is distinct, with a Uto-Aztecan flavor. The Hopi referred to as the "Peaceful People," are deeply religious and believe that everyone must live in peace and harmony with nature. Many in the Hopi community retain their language, beliefs, and traditional ways. The Hopi have strong family units and reject much of the intrusive outside culture. The Hopi Reservation is surrounded entirely by the Navajo Reservation. The Hopi, Navajo, Apache, and the Pueblo People occupied similar territories with a broad range across Northern Arizona and New Mexico. Hopi affluence attracted raiders and forced the Hopi to maintain strong and constant defenses. 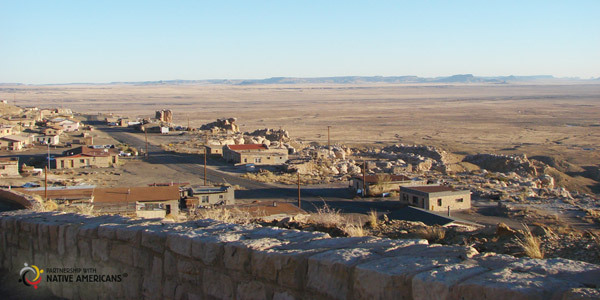 Although many of the Hopi villages were widely disbursed, they eventually settled on the top of three mesas, which were very difficult to attack. The oldest continually occupied village in the United States is a Hopi settlement called Oraibi. Oraibi has been in existence since 1150 AD. The Hopi have always been outstanding weavers and artisans. They cultivated cotton to make cloth, which they traded with other Indian peoples as far south as Northern Mexico. The Hopi were experts at dyeing and embroidery. The Hopi have been refining the art of pottery-making for nearly a thousand years. They had the finest pottery in the Southwest at a very early stage. From early on the Hopi were ingenious hunters. Not only did they use bows and arrows but also pits and corrals to capture their game. They were also noted agriculturists (growing squash, beans, corn, cotton, and fruits) and raised wild turkeys. The Hopi developed the means to store food in case of drought or other crop failure. One of the major preoccupations of the Hopi is rain. Corn, which is at the center of their culture, depends upon rain. According to Hopi culture, if it rains the Hopi have performed their ceremonies properly and have lived a good life. No Indian people have a richer religion, mythology, or ceremonial life. The Hopi were monogamists and marital scandal was rare. They used peer pressure and cultural values to maintain law and order. Liars were ostracized. Even today the Hopi maintain a rich cultural tradition and set of values that govern their daily lives. The Spanish had little chance of converting these people to Catholicism. "The Hopi people have developed a way of life rooted deep in the traditions and experiences of their ancestors. We look to the wisdom of the past to assist us in those decisions which determine the future of ourselves and our children. To follow another course would be untrue and would bring upon us those troubles which fall upon a people who are not true to themselves and their beliefs." Maternally based clans were at the center of the Hopi culture. For years the Hopi have rejected white visions of democracy and a tribal government. The U.S. Government installed several sham tribal governments to govern the Hopi, who openly resisted. Even today the 13 villages on the three Hopi mesas have considerable autonomy from the tribal government.